Eubank Jr. says Canelo Alvarez fight is "inevitable"
By Trevor McIntyre: Chris Eubank Jr. has his sights set on a unification fight against WBA ‘regular’ super middleweight champion Saul Canelo Alvarez instead of a rematch against Billy Joe Saunders, who no longer has a world title belt after he vacated his WBO middleweight strap last year. Eubank Jr. (28-2, 21 KOs) says he wants to fight the best, and a match against Canelo Alvarez (51-1-2, 35 KOs) is a logical match for him to make. Eubank Jr., 29, recently beat former IBF super middleweight champion James DeGale last month by a one-sided 12 round unanimous decision on February 23 to win the vacant International Boxing Federation super middleweight belt. Although the IBO isn’t considered to be a major world title in the eyes of some fans, Eubank Jr. believes it’s a title that he can use to get a unification fight with Canelo. “[A Saunders rematch] will always interest me because of our history, but he doesn’t have a belt, if he has a belt it’ll be different. ‘This is why I got into the sport, to be a world champion, to collect the belts, to fight the best and there’s a lot of guys out there that will be great fights for me that have these belts,” Eubank said to No Filter Boxing. Canelo is fighting next against IBF middleweight champion Danny Jacobs (35-2, 29 KOs) in a unification fight on May 4 on DAZN. If Canelo wins that fight, he’s expected to fight a third match against Gennady Golovkin in September of this year. Canelo’s schedule is open for May 2020, however. That could be a good time for him to go back up to super middleweight to fight Eubank Jr. in a unification fight. The likely best fight for Canelo at 168 is Eubank Jr. WBA Super World super middleweight champion Callum Smith might be the best fighter in the 168 lb division, but he’s not been able to generate the same kind of interest in his fights as Eubank Jr. Perhaps one reason for that is Smith is reserved, and not as much of an outgoing fighter as Eubank Jr., and he’s not much of a trash talker. “[Canelo] is the most well known fighter in the world at the moment and he’s in and around my weight,” Eubank Jr. said. “So that is a fight that so long as everything stays on track, that will be inevitable we will share a ring,” Eubank Jr. said. Eubank Jr. has won his last two fights in beating DeGale and JJ McDonagh following a 12 round decision loss to former WBA super middleweight champion George Groves in the World Boxing Super Series tournament final last year in February. Eubank Jr. had problems getting passed Groves’ powerful jab to land his shots. When Eubank Jr. was able to get near enough to throw his shots, he was overpowered by Groves’ size. Eubank Jr. has fought most of his career at middleweight, and he’s not a true super middleweight in terms of his frame. Possibly the best performance of his career, Eubank Jr. schooled the shell of DeGale in beating him by the scores 114-111, 115-111 and 117-108. Unfortunately for Eubank Jr., he didn’t get the credit that he otherwise would have received if the two of them had fought each other a couple of years ago before DeGale’s fight with Badou Jack in January 2017. The fight was scored a 12 round draw, but it was one that a lot of boxing fans felt that Jack should have won. DeGale was never the same after the fight. Eubank Jr. lost to Saunders by a 12 round split decision in 2014. 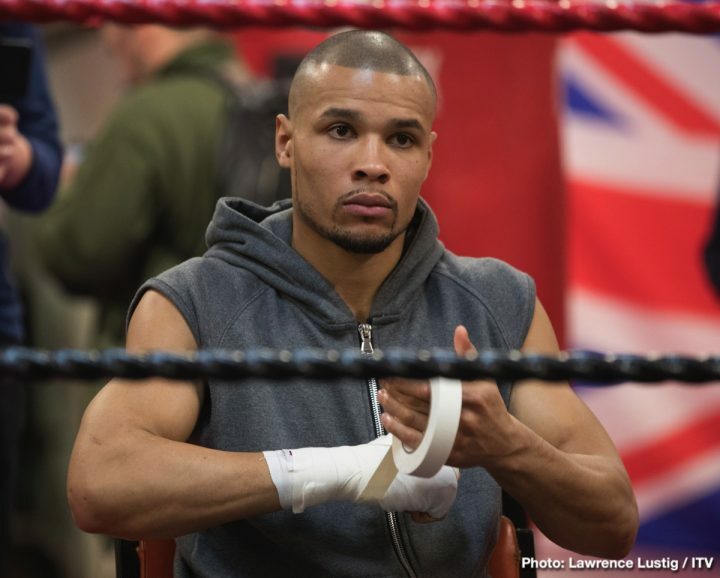 Eubank Jr. wants to avenge that loss at some point, but not now.